Our Snack of the Month Club is truly a treat! Snack of the Month Club features some of our favorite selections from some of our most popular month clubs like Potato Chip of the Month, Chips and Salsa of the Month, Nut of the Month and others. Many of our featured vendors are people we have met at food shows or through customer suggestions. 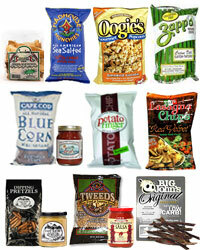 For the Snack of the Month Club, we not only feature the most popular selections from those other clubs, we also feature those items that don't quite fit in with any of our clubs such as Crostini direct from Italy or gourmet pretzels and dipping mustard or Lasagna Chips or jerky or snack crackers. Take a look at just a few of our past featured selections to the left.